It all started this morning. First, I stayed up too late last night, and when I woke up, I regretted that decision instantly. I just wanted to roll over and snug down into my delicious blankets and ignore my alarm. But I had parents dropping children off in 40 minutes and didn’t want to look like Cruella Deville when I answered the door! So I lazed around a bit, twittered, facebooked, and emailed ANYWAYS, with only one eye. Then decided I really should get up! But now, there was only 15 minutes til doorbell time. Crap. I guess it’s ponytails and a bad attitude today ( I don’t do well without my morning shower). The morning got worse as I went along and I was just about to throw in the towel. Then I decided not to let the morning’s events get me down. And what’s the best way to do that?? Make something yummy, that’s how! So I stuck my nose in my fridge to see what fixin’s I had for whippin’ up a yummy, quick breakfast. Kids wanted pancakes. I wanted heaven. I NEEDED heaven… so this is what I came up with. Enjoy! Put all those ingredients (up until the lemons) into a mixing bowl in the order they are written. When you add your milk, add it slowly as not to pour in too much. You want it sloppy, but not soupy. Then add the juice of one lemon and the zest of both. 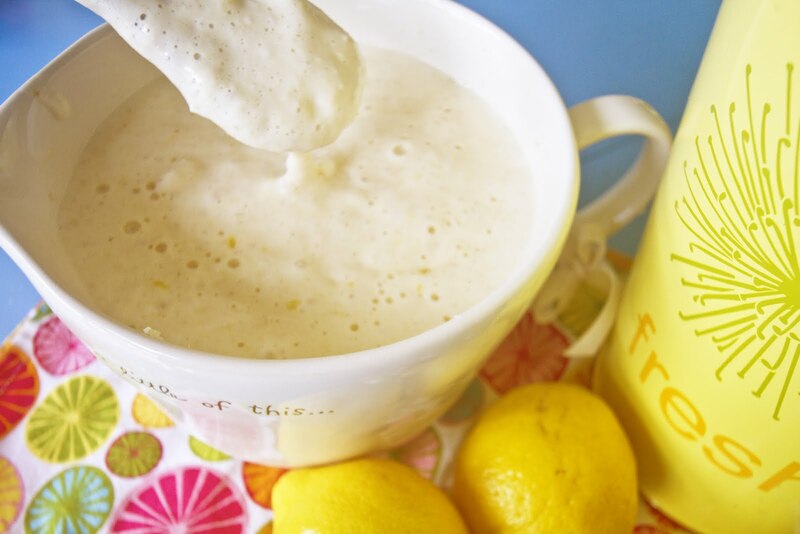 Set aside the juice of the second lemon for mixing with the mascarpone cheese topping. No mascarpone cheese or sugar will go into the batter. Mix it all up with a wooden spoon. The batter will be quite thin and bubbly. 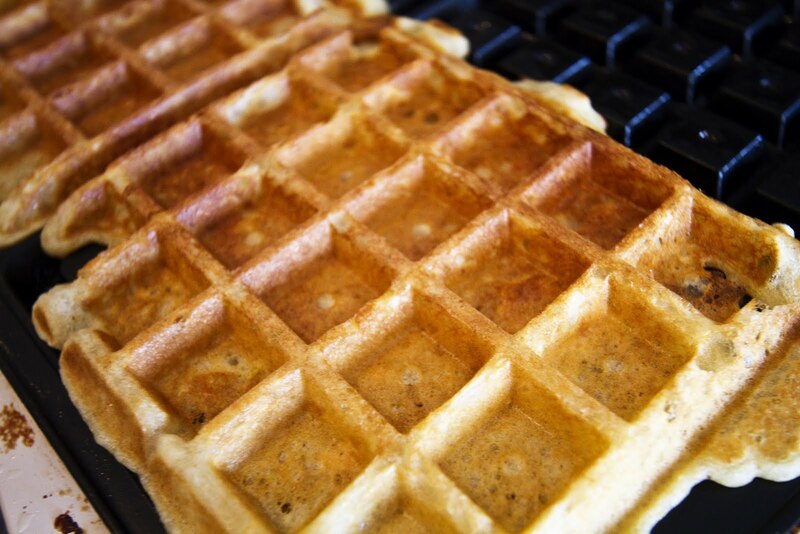 Paint your hot and ready waffle iron liberally with olive oil so you can get a crispy waffle that doesn’t stick. 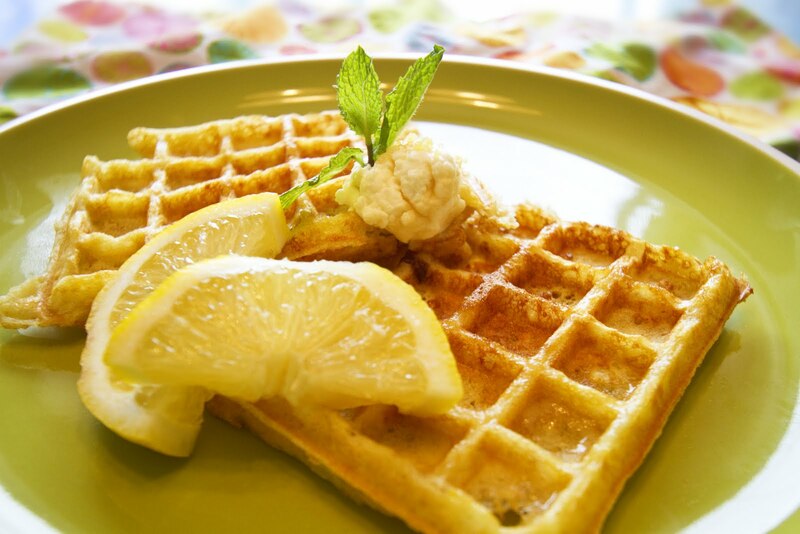 Pour 1/3 cup scoops onto your waffle iron. 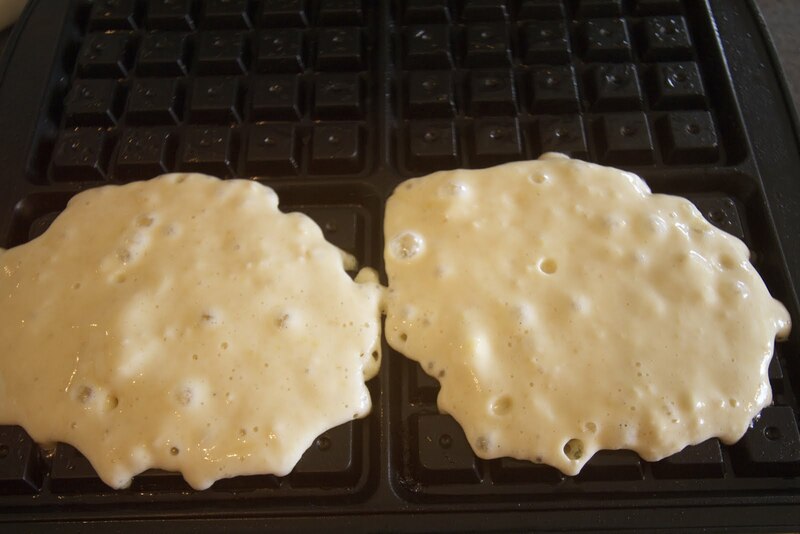 I use a 4 square iron, and 1/3 cup for each waffle works perfectly. It may appear to be too thin, but don’t worry. And DON’T OVERCOOK or they will be dry crackers and you will be really disappointed! They should be a nice golden colour but still soft on the inside. They will not be thick and cakey. They will be light, airy, and crispy, with a bit of chewy softness in the middle. This is a perfect colour! Doesn’t that just look like heaven on a plate? It IS. 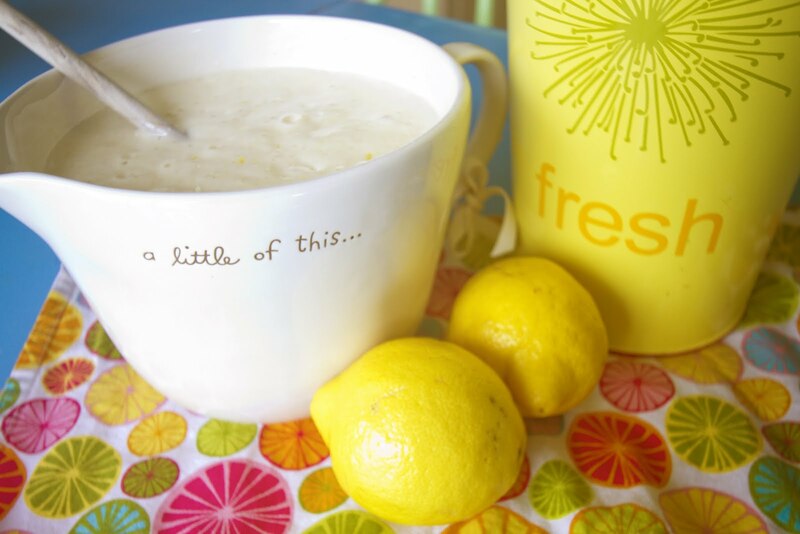 So next time YOU are having a Cruella kind of day, mix up a little lemony sunshine for yourself or your family and just let it all go. It works every time. I really need to come for a sleepover and have you make me breakfast with one of your special Indian coffees too! I can almost taste the dishes…soooo goood! Beautiful photos of your creations! 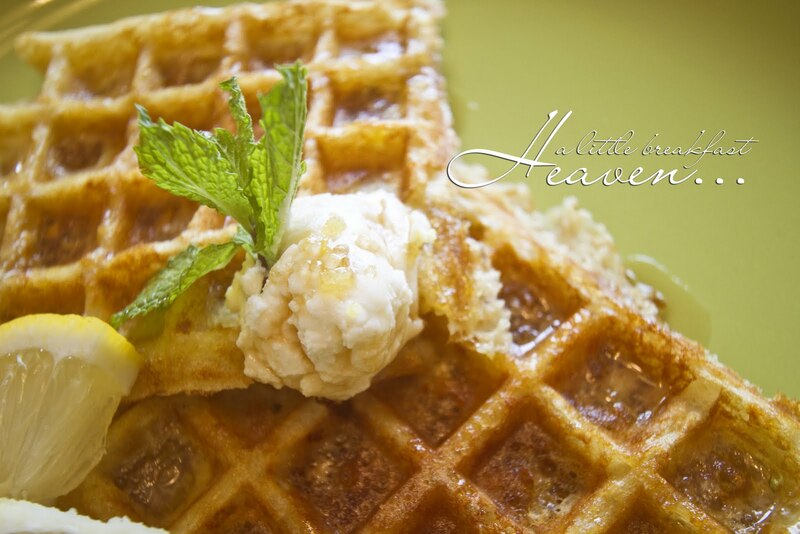 After reading this and seeing your photos I developed a wicked craving for waffles! YUM!!!! I am moving in with you!